Regrout Systems is OC's number one provider for tile repair, tile and grout cleaning, regrouting, and leak repair and prevention. Whether you have a few small cracked or chipped tiles, mildew and mold in your groutlines, or need the whole bathroom or kitchen caulked and cleaned Regrout Systems is at your service with friendly team members, affordable rates, and the highest quality workmanship in the industry. Don't spend all day scrubbing that old dirty tile - Let Regrout Systems do the heavy lifting. Your LImbs (as well as your pocketbook) will thank you for it! Why live with cracked, chipped or broken tiles? Live instead with a beaultifully complete tile floor or counter-top. Tile replacement is painless with Regrout Systems. We use only low dust or vacuum saws to cut and remove the damaged tile's grout. This cut isolates the problem tile and protects the surrounding tiles from chipping. Our tile repair specialists then chisel out the damaged tile and level it precisely with the existing tiles. After matching your grout with the appropriate texture and color we set the tile and viola! Like NEW. OH! We like to have fun, too! Today’s harsh tile cleaners often cause grout to deteriorate or discolor but leave your tile in near perfect condition, We often hear customer's fearing a complete tile restoration is in order. But it’s not! Regrout Systems' expert tile repair specialists can fix your damaged kitchen or bathroom's counter and floor tile grout, leaving it looking (but not costing) like new. First we carefully remove the old, damaged grout, replacing it with fresh, new grout. we then schedule a convenient follow-up visit to apply a 15-year grout sealer to the new tile grout to help protect it and keep it looking new for years! Simple, affordable and beautiful! Lets' face it. Caulking becomes mildewed and cracked over time causing unsightly grimy cracks that can leak and often lead to dry rot and molding. The main trouble areas are around sinks, bathtubs, and on glass shower enclosures and fiberglass shower pans. Don't be embarrassed; it is the nature of the beast, and happens to everyone. Regrout Systems' tile repair specialists can remove that old mildewed caulk, and replace the joints with a specially treated mildew resistant caulking. Speaking of special treatment...you won’t believe how much cleaner your bathroom or kitchen will look with freshly caulked joints and enclosures! Your eyes, lungs, and family will thank you for it. 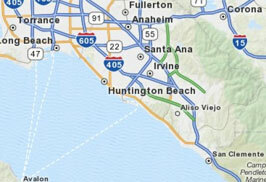 We service all of Orange and L.A. counties, And travel to you for a FREE in-home professional repair estimate. No worries! You already have. Give us a call at any of the numbers above or fill out a request for a FREE ESTIMATE and We will find YOU! It doesn't get much easier than that.